If you want to be an innovator on the beach and turn some heads, make a chainmail bikini. Chainmail was armor used by soldiers in the Middle Ages made with interlinked metal rings. The second part of the word chainmail is derived from the French word, maille, which means mesh of net. Using a metal, such as aluminum, decreases the weight of the chainmail bikini and makes it bearable to wear. Select the type of ring coil to use. 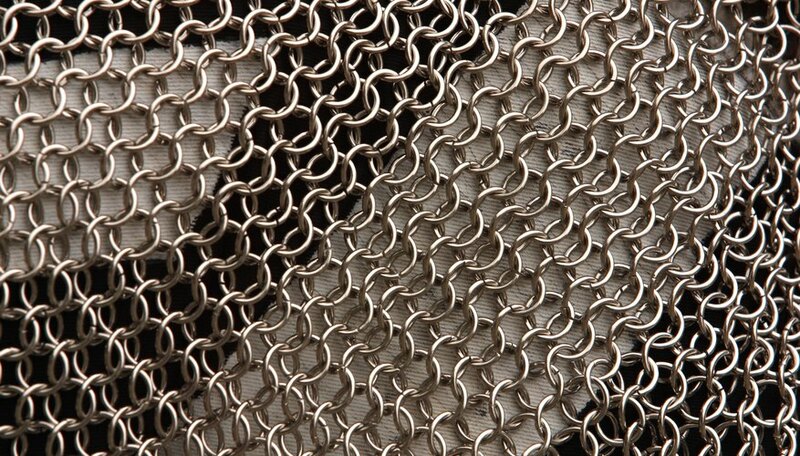 Common metals used for chainmail are aluminum, galvanized steel, stainless steel, bronze, copper, titanium and anodized aluminum. Insert 0.094-inch aluminum ring coils into mini-bolt cutters and cut the coils to make open rings. The thicker coils cover more parts of the body, which is appropriate for bikinis. Calculate the size of the bottom bikini pieces. Calculate the waist string length, front bikini piece and back bikini piece, using a tape measure. Add 1 inch to each measurement to ensure the bikini has room for movement. For example, the front waist string length is 15 inches and the back waist string has a length of 15 inches. The front bikini piece is a triangle with a 12-inch area. The back bikini piece is a triangle with an 18-inch area. Calculate the size of the top bikini pieces. Calculate the front chest length, front chest width and back chest string length, using a tape measure. For example, the front chest length is 15 inches and the front chest width has a length of 5 inches. Multiply the front chest length to the front chest width to calculate the front piece dimension, which is 15-by-5 inches. The back chest string length is 17 inches. Weave the rings together. Squeeze the ends of the ring to close it, using two linesman pliers. Hold an open ring with linesman pliers in one hand. Insert the open ring into the closed ring and squeeze the ends of the open ring to connect it to the closed ring, using the other linesman pliers. Repeat until you make a front waist string the length of 15 inches. Connect the second row of rings to the first row. Make the second row 5 inches in length. Position and connect the second row in the middle of the front waist row. Connect the third row of rings to the length of 4 ½-inches to the second row. Decrease the length of each subsequent row by 1/2 inch. Stop when the row length is 2 inches. Insert an open ring into the closed ring and squeeze the ends of the open ring to connect it to the closed ring, using two linesman pliers. Repeat until you make a back waist string the length of 15 inches. Connect the second row of rings to the length of 7 inches. Position and connect the second row in the middle of the front waist row. Connect the third of rings to the length of 6 ½-inches to the second row. Decrease the length of each subsequent row by 1/2 inch. Stop when the row length is 2 inches. Connect the bottom rings of the front waist line with the bottom rings of the back waist line, using two linesman pliers. Connect the end rings of the front and back rings together to complete the bottom bikini piece. Add double-sided tape to the inside edges of the bottom bikini to hold it in place. Insert an open ring into the closed ring and squeeze the ends of the open ring to connect it to the closed ring, using two linesman pliers. Repeat until you make the first row of the length of 15 inches. Connect the second row of rings to the length of 15 inches. Continue connecting rows under the previous row until the width of the front chest piece is 15-by-5 inches. The bikini top is a a rectangle. Insert an open ring into the closed ring and squeeze the ends of the open ring to connect it to the closed ring, using two linesman pliers. Repeat until you make a back chest string the length of 17 inches. Connect ends of the back chest string to the ends of the front chest piece, using two linesman pliers. Add plastic halter string that goes over the neck to hold the chest piece in place. Adjust the dimensions of the top and bottom bikini pieces to fit the measurement of your body. Assemble the chainmail bikini on your body so it stays on. Chainmail does not stretch like other bikini materials. Have a friend close the last rings together while the bikini is already worn.